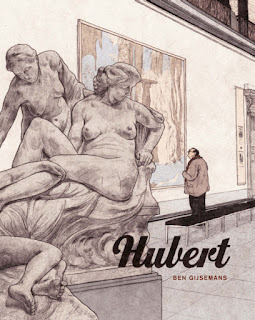 I love a good little comics news story, and this one has a bit of everything: a giant of the medium, a seminal publishing house, and a happy ending. Last Friday saw Humanoids purchase at auction, their first and original logo, designed and illustrated by co-founder and legendary comics artist, Moebius. It features a center-piece of a pillar and floating orb, the former engraved with each of the four founding member's names, with four rather ghoulish faces (again presumably representing Druillet, Moebius, Dionnet and Farkas) peering out from behind the installation. The art of the original logo had been missing for over 40 years, but has now been reunited with the publishers once more. Les Humanoïdes Associés (roughly United Humanoids)was founded in its original iteration in Paris in December 1974 by Moebius, Jean-Pierre Dionnet, Philippe Druillet and Bernard Farkas in order to publish Métal Hurlant magazine, a sci-fi publication that went on to have multiple foreign language versions that heavily impacted and influenced not only comics, but wider pop culture. The magazine became a separate entity from the publishing house in the late 80s, when a number of difficult financial situations led to the company being bought by Swiss publisher, Fabrice Giger, in 1988. Giger proceeded to relocate the French headquarters to the US in 1999, and develop it into one of the most respected comics properties in the world, and continued publishing works by European comics royalty such as Moebius, Jodorowsky and Enki Bilal, along with newer authors. In the past 2 years, the company has also opened offices in Japan and the UK.